BOSTON and NEW YORK CITY—This year’s New England Indoor Track Championship unfolded at the Reggie Lewis Track and Athletic Center at Roxbury Community College in Boston on March 2, while a mere week later, on March 8-9, this year’s New Balance Nationals took place at the Armory Track and Field Center in New York City. Unsurprisingly—since Maine features some standout track athletes—local schools were well-represented at both events. The Gorham boys showed their stuff in freshman star Andrew Farr, and in sophomore standout Ryan Gendron. Farr finished 12th in the 55 Dash Prelims—the only ninth-grader in the entire pack. His time, 6.62, was just .22 seconds back from the winning time, 6.40. In the 300, Farr finished 15 (of 25), in a time of 36.29. Mange Camara of Watertown, Massachusetts won the event—another event featuring no freshmen beyond Farr—in 34.47. Gendron took 16th (of 18) in the High Jump, leaping 6-01.00. The Gorham Girls put in a showing as well. Sydney Connolly finished 27th in the 55 Prelims, crossing in 7.71. Kate Tugman took third in the Two Mile, crossing the line in 10:55.54. The 4×200 quartet of Maddie Michaud, Alyvia Caruso, Avery Germond and Nevaeh Moore took 26th in 1:52.00, about nine seconds back from first. Westbrooker Dante Lingley finished 21st in the 55 Prelims (in a time of 6.80), thus failing to make the cut for Finals. Fellow Blaze Mahamed Sharif, meanwhile, took third in the 1000 (2:31.89). Cam Holloway landed middle-of-the-pack, 20th, in the 55 Hurdles Prelims, missing the Finals cut as Lingley had. Big-name Lady Blaze Nyagoa Bayak won the High Jump, as we all knew she probably would; Bayak leapt 5-09.00 (still three inches shy of her PR!) for the crown. Aiden Willey, Zack Allocca, Andrew Pendleton, Khyler Hart and Ian Reilly repped for the Bonny Eagle boys: Willey finished 23rd in the One Mile (4:39.84). Meanwhile, Allocca, Pendleton, Hart and Reilly finished 20th in the 4×200 (1:36.77). Allocca also competed in the Long Jump, finishing 24th with a leap of 19-04.25 (well back from his personal best). Lady Scots Hannah Stevens, Delaney Hesler, Amelia Alexander, Hannah Kaspereen, Zoe Schmaling, Kanani Lopes, Emma Noonan, Kayla Raymond, Gretchen Biegel and Ami Beaumier were all on-hand. Stevens finished 19thin the 1000, needing 3:14.76 to cross the line. Hesler, a superb freshman, took 19th in the One Mile, needing 5:25.80 to do so. 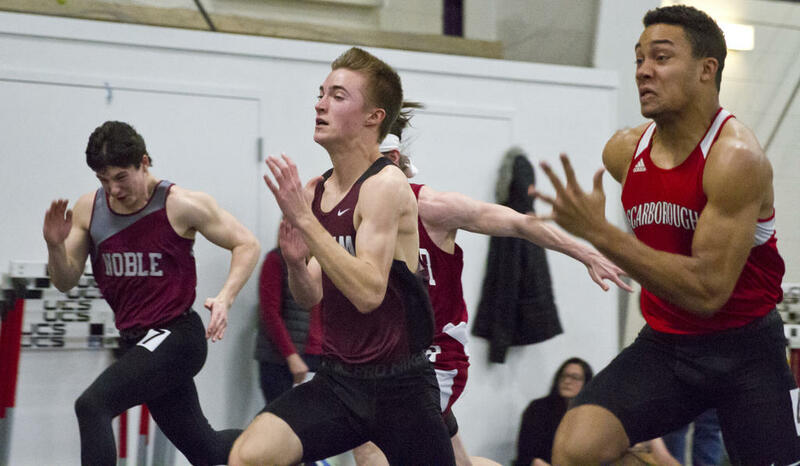 Alexander finished 23rd in the Two Mile (12:14.74), while the foursome of Kaspereen, Schmaling, Lopes and Noonan came in 23rd in the 4×200 (1:51.71), and the other foursome of Raymond, Stevens, Biegel and Beaumier came in 10th in the 4×800 (9:45.54). The Windham boys outfit also sent a small contingent to the competition; Anthony Sawyer, Sam Cole, Connor Abbotoni and Mason Rosborough finished 19th in the 4×800, needing 8:35.23 to finish. Farr competed in the Freshmen 400 at Nationals, but finished towards the back of the pack in a time of 56.14. That’s well off his best mark, which, if he’d matched it, would have placed him somewhere in the middle of the standings. Reportedly, he was nursing a minor injury. Tugman took 13th (of 40) in the Emerging Elites 3000, needing 10:16.90 to do so; she then finished 16th (again of 40) in the Emerging Elites Two Mile, in a time of 11:00.84. Evelyn Kitchen partook of the Emerging Elites High Jump, finishing near the back of the pack with a 4-11.00 leap. Sharif competed in the Emerging Elites 800, where he finished third (1:53.719); Bayak competed in two events at Nationals, the Championship High Jump and the Emerging Elites Triple Jump. She finished second in the former (5-10.75), and fifth in the latter (38.04.75), which she won last year. Andrew Farr, seen here at States, traveled both to New Englands and Nationals. Zack Allocca, seen here at States, also competed in two events for Bonny Eagle at NEs. Mahamed Sharif, seen here at States, won his race at New Englands as well. Nyagoa Bayak, seen here at States, competed at New Englands (where she won the High Jump) and at Nationals (where she claimed second in the High Jump and fifth in the Triple Jump).